According to a new CNN/ORC poll, President Barack Obama just cracked a 50 percent approval rating, the highest it’s been in two years. The poll follows an eventful week for POTUS: he secured an important trade agreement, was handed two historic Supreme Court wins (one regarding the Affordable Care Act and the other gay marriage) and delivered a moving eulogy at the funeral of Rev. Clementa Pinckney in Charleston, South Carolina. 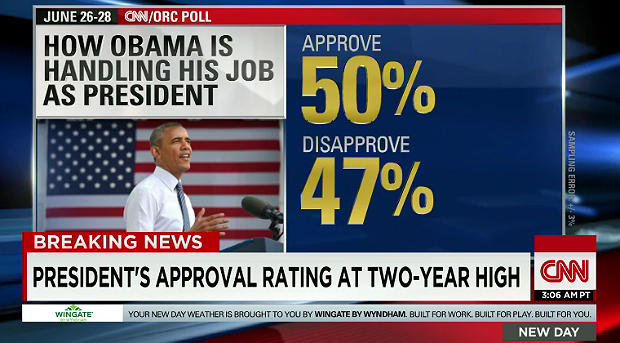 POTUS's approval rating in July 2015, via CNN. Obama’s rating is 5 points higher than it was "most recent survey and his highest approval rating since May 2013.” The survey also marks the second time that his disapproval rating of 47 percent has dipped below 50 percent. Political pundits point to upticks in Obama’s popularity due to his handling of the economy and with race relations. Obama’s popularity however is still largely divided on race lines, with 91 percent of African-Americans approving of POTUS, compared to only 39 percent of whites.